Ding-Dong Hong Kong! Let's sing-along with Teacher Ham! Here's 17 of his most CRAZILY FUN English songs for kids of all ages EVERYWHERE! Are you ready? 1-2-3 Let's GO! Hi kids! 'Teacher Ham's English Songs For Children' (Volume 1) is the first album of children's songs by educator and singer-songwriter Samuel Alexander Barbour. Samuel (or 'Teacher Sam' as his students call him) has taught English as a primary native-English teacher or PNET since 2009 in Hong Kong. Overall, Samuel has taught English in Hong Kong since 2007 including one year as a Kindergarten teacher. Many years ago, when introducing onsets and rimes in a phonics activity, one student played with the name, 'Teacher Sam' changing it to 'Teacher Ham' much to the delight of the rest of the class. From then on, the name has stuck! Alongside teaching English to youngsters, my great passion is creating original resources for my students. Everything from poems, chants, stories and songs set to nursery rhymes and original melodies are created to ensure that my students have a fun and meaningful learning experience complete with holistic and authentic materials personal to them. The 17 songs in this album have been tailor-made for my students (all learners of English as a second and sometimes third language) ranging from primary one to three (approximately 6-10 years old) but can be enjoyed by children of all ages. Many of the songs have been used as accompaniment for some of my award-winning English Dramas and performed by my English Drama Club and Choral Speaking Group respectively. Many of the songs promote encouraging themes such as being positive and focussed, cultivating resilience and the importance of teamwork and hard work. Other songs explore themes more personal to Hong Kong whilst others focus on developing good personal hygiene habits. All in all, this album is an eclectic mix of different rhythms and styles, interesting and easy melodies and funny and meaningful lyrics designed to both attract and teach young learners in a gentle, light-hearted and fun manner. After all, children learn best through play and singing is a great way for them to have fun and relax whilst absorbing new vocabulary and melodies for example. So, buckle up and sing-along with Teacher Ham and his CRAZY English songs for kids of all ages EVERYWHERE! Are you ready kids? 1-2-3 Let's GO! Thank you for your support and I hope that my songs can be useful and fun for babies, toddlers, children, educators and parents alike! Best wishes and happy learning! -A gentle reminder to stay focussed on studying well to be successful and achieve one's goals. -Another light-hearted, humorous rather disgusting and Roald Dahl-esque song about encouraging children to develop good personal hygiene habits. This time, it's about NOT picking your nose. What a disgusting and dirty habit! Why do children do it? Keep your nose clean kids! -Here is a fun and quick rock-style song about Halloween that allows students to shout out the words. -In this fun, catchy and easy song, learn all twelve animals of the Chinese Animal Zodiac. Have a very happy, prosperous and healthy upcoming Year of the Pig! What animal are you? Rat, Ox, Tiger, Rabbit, Dragon, Snake, Horse, Goat/Ram, Monkey, Rooster, Dog, or Pig? -Ahoy there landlubbers! Here is a great little warm-up song about pirates that's easy to remember and sing and dance to. 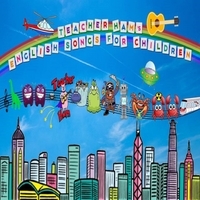 -This is Teacher Ham's song about 'yum cha' or drinking tea, one of his most favourite hobbies! Sing-a-long to this fun and easy song and learn some vocabulary about food, drink and restaurants along the way! -Hey kids! When life gets you down, don't worry. Keep calm and stay positive! When life is going well, great! Enjoy it but don't get too complacent! Try to be positive, hard-working and ready for anything! This song has a slight jazz-style lilt to it and introduces several rhyming words. -A song with a theme of staying positive, not giving up and cultivating self-discipline and resilience. The tempo is nice and relaxed and easy for young students to learn, remember, sing and dance to. -Robot X is an electronic-inspired song celebrating my students' fine work in planning and building robots made of recyclable materials. All music and lyrics written and recorded by Samuel Alexander Barbour. My sincere thanks to them both. *Follow Teacher Ham online at https://www.youtube.com/user/englishtv123 for more fun and interesting resources to assist babies, toddlers and children learn English.